Last week at this time it was -7 degrees below zero outside and eleven inches of snow laid a white blanket covering my yard and decorating the shrubs and trees. Today, the thermometer tempted the 60 degree mark, and only small patches of snow lay in shady concealed patches as evidence of the recent past activity. I love being able to experience the joys of snow but not burdened down with the negative side effects for months at a time. I opened the window allowing fresh air to seep in and rejuvenate the air inside the house. As I did this I noticed what looked like hailstones covering the hill along side of the driveway. It looked like a meteor shower had occurred through the night leaving its calling card on my lawn. Upon closer inspection I realized that though the snow blower had done a fine job of cleaning the driveway, I now had a huge job of cleaning the rocks out of the grass. 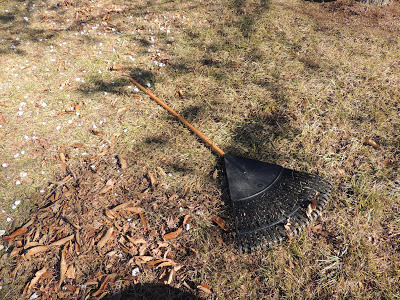 So, to the garage I went, to hang the snow shovel up and unearth the garden rake. As I began this enormous project and the blisters began to form on my hands, I thought how much fun this job could be if it had many helping hands. The childhood saying, “many hands make light work” rumbled around in my mind and kicked on the imagination switch. It is true. The mundane jobs of family living are sparked into flaming fun when the right attitude and spin is put on the project. I use to tell my boys, that if we all worked together, there would be more time for all of us (me included) to play together. Those times of working together usually started with grumbles and ended with fun and often with heartfelt, deep conversations. When I bought a fourth pitch fork, eye brows raised. But some fond memories were developed from the times all four of our family members cleaned the barn together. We made up games and contests. Sometimes we sang and told jokes. Topics were discussed and solutions were born, all at the end of a pitch fork. My boys learned the value and satisfaction from working hard, the joy and reward of completing a task and of doing a job well, developed teamwork skills and practiced communication skills. Work in a family unit is unavoidable. If only one person does all the work resentment and anger develop. Why not use these household chores as opportunities to open the lines of communication, build better and stronger relationships, learn more about one another and have a little fun? In years past, conversation around preparing dinner, eating dinner together and washing and drying the dishes were family chores that built strong bonds between family members. These common daily chores within a family developed teamwork, cooperation, sharing and life time skills that could be transferred into the workforce and future families. In the era of faces being glued to an electronic screen for most communication and socialization, families need to consciously make an effort for one-on-one interaction time. But, let’s get back to raking the gravel out of my lawn. How could this possibly be fun? Here are a few of my brainstorms as I dreamed about being helped by a group of energetic children. Remember activities should always be developmentally appropriate and safety should be a high priority. Since I do not know about your yard, please use common sense. I live in the country and have lots of space. You may not have this. However, you can adapt this type of thinking for other household chores. Attitude is always 90% of our response to life. So have fun and find joy in whatever you have to do! so that reward comes quickly and attention spans do not become taxed. drive. If it lands in the yard, points are deducted. of the way. Set up guidelines as to where the rocks can be thrown and only one at a time, etc. container in the center of the driveway and make that your target. This activity will practice the same throwing and target skills as used in baseball and basketball.